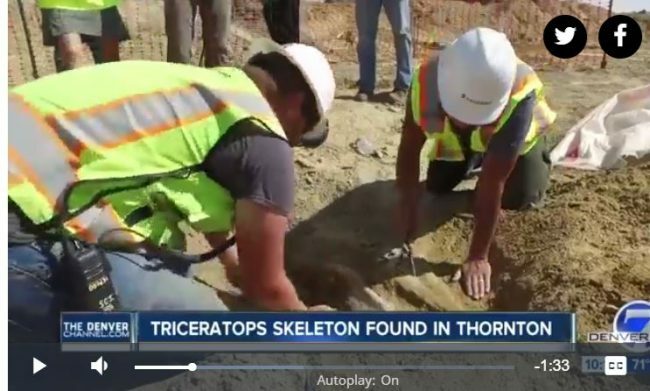 The Denver Museum of Nature & Science has confirmed that the fossil of a Triceratops has been uncovered at Thornton’s new Public Safety Facility at 132nd Avenue and Quebec Street. So far, a horn and shoulder blade have been unearthed. Work will continue for the next several days at the secure construction site to excavate the triceratops. The Museum is looking to tie-in other significant finds in the region to see what was occurring in the habitat when the Rocky Mountains were forming 66 million years ago. “The Museum is excited to work with the Thornton community as we learn more about this incredible find,” George Sparks, president and CEO of the Museum said.